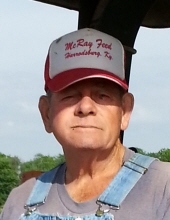 A Shelbyville resident Mr. Walter Richard Chesser age 78 passed away surrounded by his family and close friends on March 23, 2019. He was born the son of the late Bluford and Clackie Mae Lewis Chesser in Spencer County Kentucky. Walter was machine operator and retired from American Air Filter in Shelbyville after 25 years of service. He then went to work for Browning Chevrolet in Eminence, Kentucky and retired after 15 years of service there. He enjoyed farming, horses and spending time with family and friends. Mr. Chesser was preceded in death by his parents, his wife Janice Mae Stevens Chesser, his son Barry Robin Chesser, daughter Rita Faye Davis, a granddaughter Stephanie LaRee Chesser Santos, sisters Stella Chesser, Nettie Reynolds, Mable McAllister and two brothers Ancil and James Chesser. He is survived by his daughter Connie Chesser-Ruble(John) of Shelbyville, his brother Bluford Chesser (Linda) of Mt. Washington, Ky. Five grandchildren Shannon, Jessica, Sabrina, Cody, and Austin. Three Great-grandchildren Anyssa, Anquan, and Lane. To send flowers or a remembrance gift to the family of Walter Richard Chesser, please visit our Tribute Store. "Email Address" would like to share the life celebration of Walter Richard Chesser. Click on the "link" to go to share a favorite memory or leave a condolence message for the family.